HOMESTEAD, Fla., Nov. 21, 2015 – Ford Chip Ganassi Racing officially announced today the four drivers who will compete in the all-new Ford GT for the 2016 IMSA WeatherTech SportsCar Championship. Drivers Ryan Briscoe, Richard Westbrook, Dirk Müller and Joey Hand have been selected for full-time rides in the two Ford GTs that will compete in the full IMSA WeatherTech schedule next year. Hand and Müller will co-drive the No. 66 Ford GT, while Briscoe and Westbrook take the reins of the No. 67 Ford GT. Fans of Ford lore and sports car racing will immediately take note of the historic significance of the car numbers – the original predecessor of the Ford GT, the Ford GT-40, won the 24 Hours of Le Mans in 1966 and 1967. Ford marks the 50th anniversary of that first significant win with the return of the Ford GT to Le Mans in 2016. The IMSA lineup for Daytona represents a true global effort, with drivers from the United States (Hand), United Kingdom (Westbrook), Australia (Briscoe) and Germany (Müller). While Ford's history with sports car racing stretches back to the 1960s, today's factory effort plays an important role in developing Ford Motor Company's EcoBoost technology. 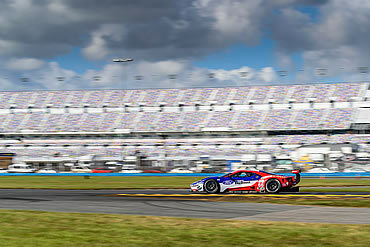 Ford's twin-turbo 3.5-liter EcoBoost V6 raced to three wins with Ford Chip Ganassi Racing, including a victory in the prestigious 12 Hours of Sebring, seven podiums and more than 15,000 endurance racing miles in its first season of IMSA competition in 2014. In 2015, the team and engine won the Rolex 24 At Daytona and added another win at Circuit of the Americas (COTA) in the Lone Star Le Mans. The all-new Ford GT supercar is the culmination of years of Ford innovations in lightweighting, aerodynamics and ultra-efficient Ford EcoBoost engines. Ford announced it would return to GT racing with the Ford GT last June at the 2015 24 Hours of Le Mans. Ganassi’s team has captured seven IMSA championship titles, 46 wins and has six overall victories at the Rolex 24 At Daytona. Joey Hand Returns to Ford Chip Ganassi Racing: Hand, widely considered one of the best road racers in the world, returns for his second full-time season with Ford Chip Ganassi Racing after helping the team finish fourth in the 2015 IMSA Prototype points standings. Hand co-drove to the win at the Lone Star Le Mans at COTA and recorded five podium finishes, including a second-place in-class finish at the season finale at Road Atlanta. Prior to that, he won the 2011 Rolex 24 At Daytona in his first of three appearances with the team (2011-13 Rolex 24 At Daytonas). Hand led the most laps in the 2011 event, pacing 116 of the No. 01 car’s race-leading 231 laps. He led the race six times overall en route to the team’s fourth of six wins in the sports car classic. He previously competed in the DTM series from 2012-14 and had been in the American Le Mans Series from 2004-11, where he won two 12 Hours of Sebring titles and the 2011 GT Driver Championship. Ryan Briscoe Back at Ganassi: Twelve-time IMSA and eight-time Verizon IndyCar Series race winner Ryan Briscoe rejoins the Ganassi team after most recently running the No. 8 NTT DATA car in the 2014 Verizon IndyCar Series for the team. Briscoe began his IndyCar racing career in 2005 driving the No. 33 for Target Chip Ganassi Racing (TCGR) when it was a three-car team with Scott Dixon and Darren Manning, and was also a driver of the team’s 2005 Rolex 24 At Daytona entry. Over the past 10 years, Briscoe has driven for multiple IMSA teams, recording 12 wins over 36 races, and most recently won the 2015 Rolex 24 A t Daytona and the 2015 12 Hours of Sebring in the GTLM class. Dirk Müller Brings Experience to Ford Program: Sports car veteran Dirk Müller began his IMSA career 17 years ago and has competed in 111 races in the series. Müller has recorded 18 wins and 30 poles during his tenure and most recently competed in a full-season IMSA entry for BMW Team RLL in the GTLM class in 2014. About Richard Westbrook: Following a promising karting and single-seater career, Westbrook switched to GT racing and later moved on to sign a factory contract deal with Porsche. In 2009, Westbrook won the FIA GT2 Championship. In 2011, he signed with Chevrolet as a factory driver and spent the next five years driving for the manufacturer as part of both their GT and prototype programs. Westbrook has recorded eight wins, including the 2013 12 Hours of Sebring, the 2014 and 2015 Sahlen’s Six Hours of the Glen, and eight poles over his nine-year sports car career.